Here are the tasting results with the prices I paid on the day I bought the salmon, all of it as fillets, with the skin intact on most. I set the fish skin side down in a baking dish, brushed the unskinned side with oil, sprinkled it with salt and pepper, and slid it under a broiler for 6 minutes (it can take up to 8). The internal temperature should reach 145 degrees. There are many farms in each region; we tasted some of what was available on the retail market. Norway and Scotland salmon were on opposite ends of the taste spectrum. Norway salmon ($9.99/pound at Whole Foods Market, fish from Kvaroy Fish Farm) is what I think of as “wedding salmon.” This is what you get at events. The fish has big, deep, pink flakes, it’s moist, and if you close your eyes, you could be eating any mild fish. It has little salmon flavor. 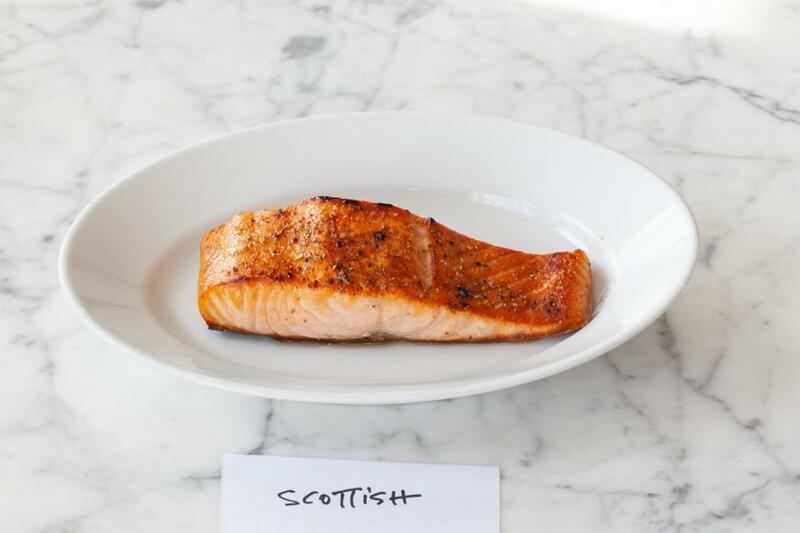 The Scottish salmon we tasted ($14.95/pound at Captain Marden’s, raised at Wester Ross Fisheries) is everything salmon should be: perfect moist texture, delicious flavor that tastes of the sea, almost buttery. This topped our list of favorites, along with Faroe Islands. Faroe Islands salmon ($14.99/pound at Marden’s, from HiddenFjord), tastes fattier than the Scottish, but not the least bit strong, with a dense, appealing texture. This fish and Scottish salmon tasted the best. Iceland salmon ($8.99/pound at Whole Foods), a pale, almost pink, color, melts as you eat it; but the texture is too soft and the taste unremarkable. 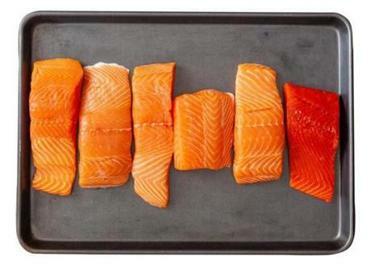 Farmed Eastern Canada salmon ($12.99/pound at Captain Marden’s) is a little chewy, mild to the point of being bland. It’s a little dry and doesn’t flake easily. Wild Alaska Sockeye ($14.99/pound at Whole Foods, previously frozen) is very dark, almost red, with lean, firm flesh that seems meaty. It has more flavor than farmed, but the dense texture isn’t winning. Wild Alaska Sockeye ($11.99/pound at Trader Joe’s, frozen) isn’t as red as its Whole Foods counterpart; it’s dry and has little flavor.